A few months ago, Tom Vasel of The Dice Tower sent out a notice that he was looking for guests to relaunch his Dice Steeple podcast. 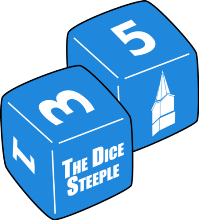 The Dice Steeple podcast is about anything related to Christianity and gaming and is shooting to be a monthly podcast. Since my goal is to be a publisher of Biblical board games I thought I might be a good guest for the program, so I contacted Tom and we set up a time to do the podcast. Well, that podcast is now out! I think it went mostly well, except at the end when I needed Tom to repeat himself multiple times before I got what he was saying. That part I would like to ignore. Otherwise, I think it is a good starting point in the discussion about Biblical board games, whether it be publishing them, designing them, or just what games are fun. Check the podcast out here! I was interviewed by Duluth News Tribune about Kings of Israel recently, and now the article is up! A couple small details were a little off but otherwise it is a very nice article about the game and gaming in Duluth in general. Check it out! The first ever Kings of Israel Bulgarian review is up! I cannot read Bulgarian but it looks nice. There should be quite a few more reviews and articles relating to Kings of Israel coming out soon. Keep your eyes open on the Funhill Games website for more updates and for more Kings of Israel video game news. I have been slowly working on a Kings of Israel video tutorial for some time now, but I realized recently that I have a ways to go before it is finished properly. So over the weekend I did a quick video tutorial to help everyone who prefers to learn things visually. It is not the high quality version I am working on but it works just fine. You can view the tutorial on the Kings of Israel Rules Page. All copies of Kings of Israel have been shipped! The second batch of international orders came in yesterday, and today they are in the mail! All Kickstarter pledges should now be shipped! International backers keep your eyes open for an e-mail announcing the shipment of your game, if the e-mail has not arrived already. Canadian and Australian backers will receive their notifications when their copies go out from within their country. American backers should have received their copies of Kings of Israel by now. If not, please contact me and I will look into it. Kings of Israel starting to appear at retailers! I posted this update to the Kings of Israel Kickstarter page a moment ago, but it applies to many preorders made through the Funhill Games website. Here it is! I have been hearing from many US backers that they have received their copy of Kings of Israel! That is very exciting! If you find any defects or issues with your copy, feel free to message me with what components are damaged. One example is that there have been a few backers who did not receive a box with their game. I believe Panda Games sent a few extra copies (sans box) to the Amazon warehouse and Amazon fulfilled orders with them as if nothing was wrong. If you are missing anything, please contact me and I will get that corrected! The international orders I am waiting to be sent from Amazon’s warehouse to my location. Normally these bulk return orders take around 10 business days to ship, and so far about 6 business days have gone by with all of the holidays in between. I did have a separate return order arrive today, but that order just contained 20 copies of the regular edition of the game so it processed faster than the approximately 300 unit order of the Kickstarter edition that has yet to be sent. I will keep everyone updated as things progress! For those with Kings of Israel in hand, if you have any questions about how the game plays, please visit the Kings of Israel FAQ page on the Funhill Games website. I will try to keep updating that page as new questions are asked. If it is not there, feel free to go to theBoardgamegeek Kings of Israel page to see if the question was asked, or just shoot me a message! And are you enjoying Kings of Israel and would like to tell others about it? There are many ways to help! Rate the game on Boardgamegeek! The more ratings Kings of Israel receives, the more validity the game has in Boardgamegeek’s rating algorithm. If you would like to go one step further, post a review or a session report to the site! Many people read the reviews and session reports posted to a game’s page and would love to hear how the game plays from a neutral source. Post a review on Amazon! The more reviews posted on Amazon the better! Are you on social media like Facebook or Twitter? Please post pictures of the game in action or link to our Facebook or Twitter pages! Take full advantage of Pinterest too! Do you know a group, website, or publication that might want to hear about Kings of Israel? Please contact me and I will reach out to them! US copies of Kings of Israel are Shipping! All US Kickstarter pledges or preorders for Kings of Israel have been entered into Amazon’s system! If you pledged or preordered a copy of Kings of Israel you will soon see a shipping notification in your inbox! International pledges and preorders will soon be shipped to the Funhill Games headquarters, and from there they will be shipped directly to backers, or to a contact within that person’s country who will then mail them to each individual. Kings of Israel games have reached warehouse! I will keep updating as things move along!